Hi all. 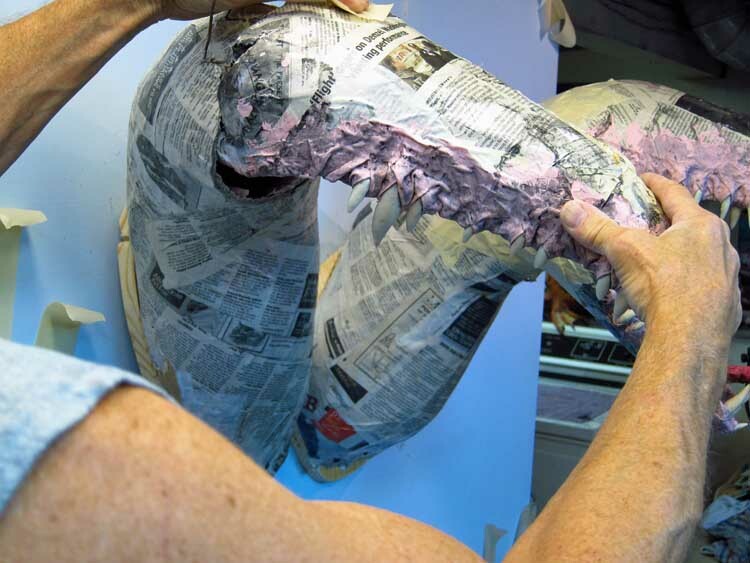 The fun begins when the paper mache pieces are ready for assembly. I want to emphasize here that, at all stages, everything is subject to change. 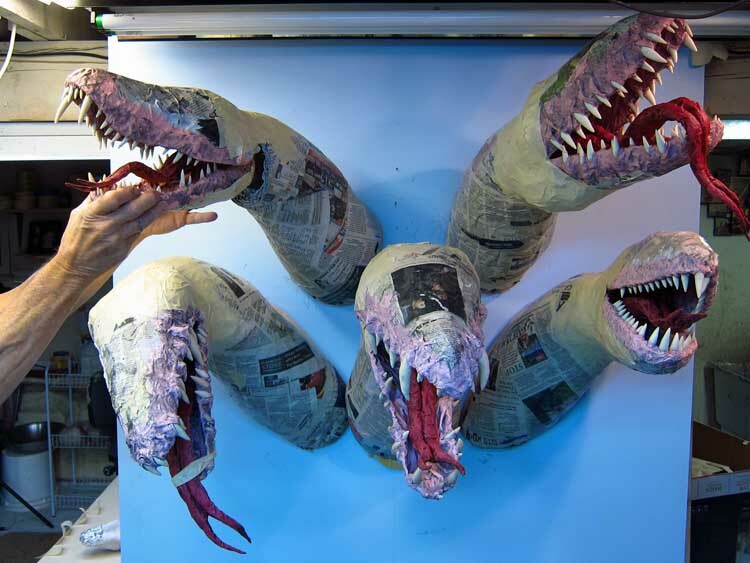 That is what I mean when I say that paper mache is “forgiving.” I am not afraid to completely revamp anything I don’t like. First, I really want these heads to be stable against the wall (actually it will be a large plaque I made out of walnut wood….more about that later) so I cut pieces of 1 inch pine boards to fit the back of the necks. 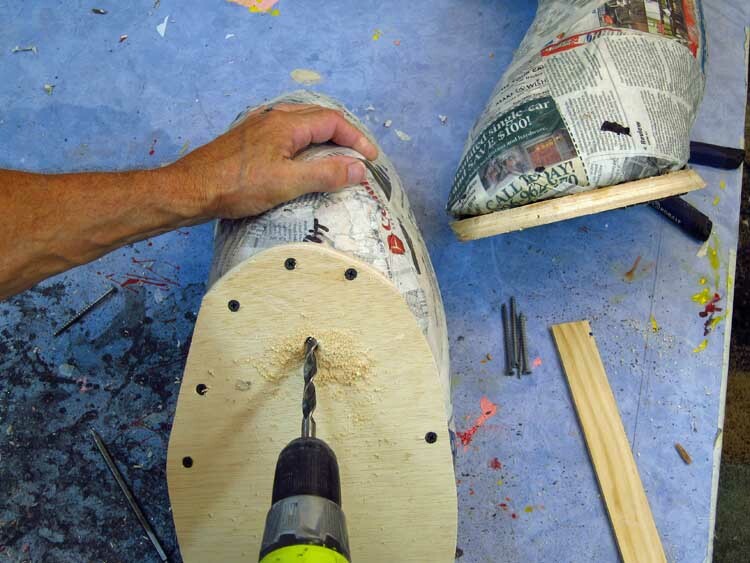 I used screws to hold the necks to the boards (and yes, screws into the paper mache works well). I also drilled holes at an angle in the wood backings. That allows me to hang the trophies on the wall over a long screw driven into the wall at about the same angle (as what I drilled in the pine backing). I hope this makes sense. It sounds a little convoluted. Then it was time to start putting the heads where I want them relative to each other on the wall. So I drove screws into the wall and hung the necks. Below is the bottom row of necks in roughly the positions I wanted. Now I know some of you have eagle eyes and you will notice the neck on the left, the one with the piece of wood sticking out. This is the neck of the black dragon, the one with the long, curved steer-like horns. Because of the torque involved with those long horns wanted to be sure there was sufficient support to hold them up. So I added pieces of pine inside the neck (from the pine backing to the place where the horns will be) for additional support. And yes, you see a few pieces of clothes hanger sticking out of the necks as well. I buried those inside the necks for extra support. One by one I started adding the jaws, upper and lower, to the ends of the necks. This is the red dragon with jaws attached. Note that I added the tongue as well. That is connected to the back of the lower jaw. 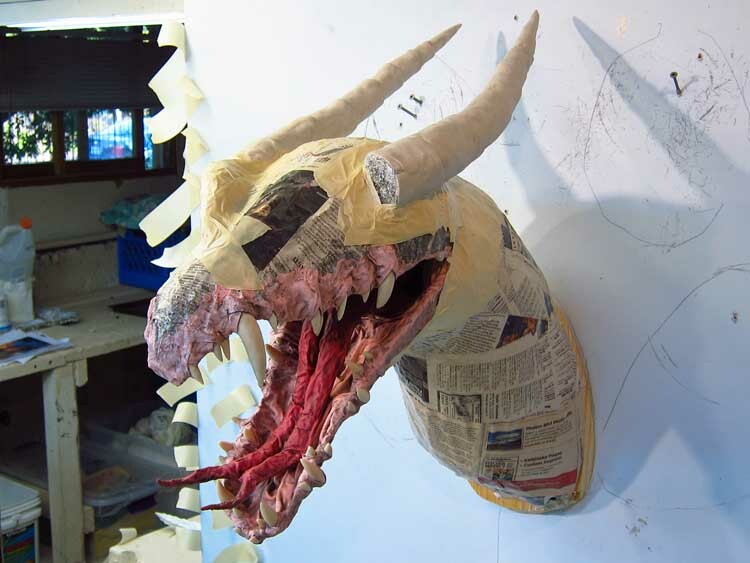 Next, the upper jaw of the black dragon. I know it doesn’t sound right when I say “upper jaw.” It’s really the rudimentary upper part of the head. I added the other two necks to the array on the wall, as well as the rest of the jaws. This is pretty close to the layout I want. Pretty close. Again, I will change it up slightly as I move along. 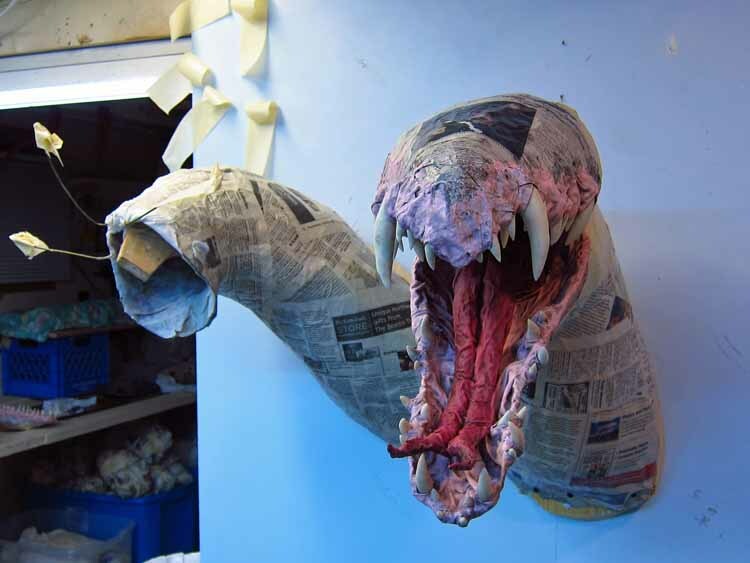 But this gives you a sense about how the heads will look together. Once I established the overall look, it was time to start building each individual head. I started with the red dragon. 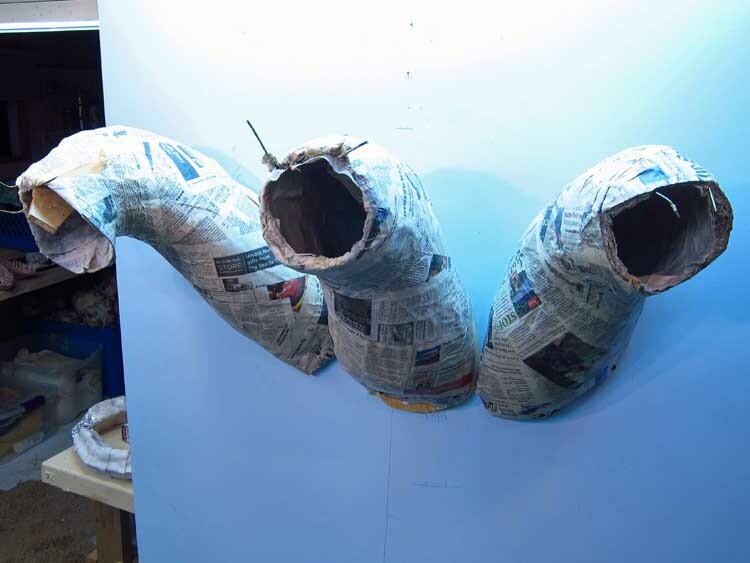 Here is the very beginning of that dragon, with the two long horns installed. Next time …more sculpting of each head. Thanks for stopping by! 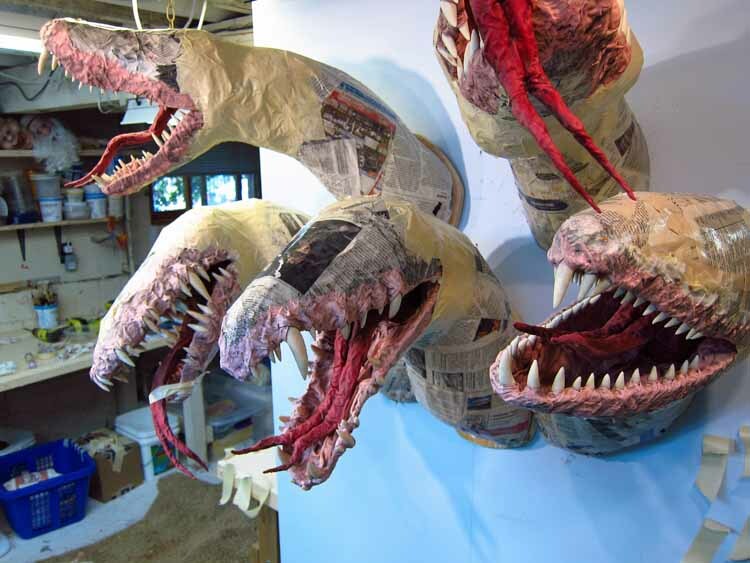 This entry was posted in Tiamat Dragons and tagged arts and crafts, cloth mache, dragons, fantasy, mixed media, paper crafts, paper mache instructions, papier mache, papier mache recipes, sculpture. Bookmark the permalink. Very exciting to see this coming together, Dan. Sheer magic! Hey Carol. Thanks for watching and your support, as always. 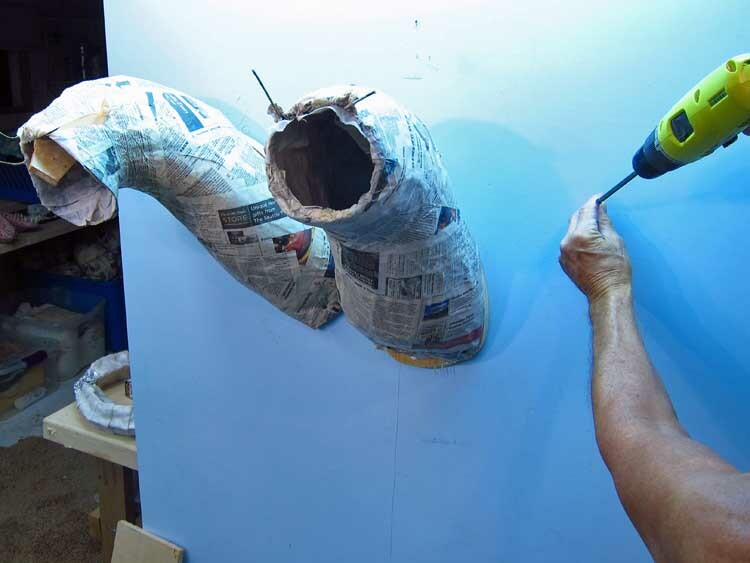 I can see already that this is going to be a truly awesome work of art, Dan! Thank you Janice. Glad you are liking this! These guys are looking awesome! Thanks for sharing your process. How do you keep your backing board upright? Hey Willow. So nice to hear from you! That backboard is a big piece of plywood that I screwed into the entertainment center behind it. That is one of the big challenges for me. The restaurant has a normal wall, drywall with studs every 16 inches. The screws that hold these heads up must be driven into studs. That’s why I had to make a big plaque. They will have to attach the plaque where there are studs, and then I’ll have screw (or something a bit bigger) driven into the plaque to hold the heads. Talk to you soon. What a massive amount of work! Do you ever feel overwhelmed and wonder what the heck you got yourself into? Amazing and incredible as always. Extraordinary and quite wonderful as always Dan ! Looking great Dan as always with your work. Hi Lynn. I’m glad you can follow. I’m glad you like this. Thank you! OH MY!!! It is getting so exciting. Thanks Kat! I’m happy with it so far. Dan, your work is so inspiring! I can’t wait to see this finished project. I’m incredibly impressed how much detail and personality you put into your work. Thanks Norma. I’m very happy with how it’s working out. I’ll try to get more posted very soon. Wow what a project but looking real nice so far. Can’t wait to see it finished. Thanks Ralph! I appreciate the comment!